“Social Entrepreneurship” is a term that has come to be applied to the activities of grass-roots activists, NGOs, policy makers, international institutions, and corporations, amongst others, which address a range of social issues in innovative and creative ways. Themed around the emerging agendas for developing new, sustainable models of social sector excellence and systemic impact, Social Entrepreneurship offers, for the first time, a wide-ranging, internationally-focused selection of cutting-edge work from leading academics, policy makers, and practitioners. Together they seek to clarify some of the ambiguity around this term, describe a range of social entrepreneurship projects, and establish a clear set of frameworks with which to understand it. Included in the volume are contributions from Muhammad Yunus, winner of the 2006 Nobel Peace Prize and the father of microfinance, Geoff Mulgan, former head of the British prime minister’s policy unit, and Bill Drayton, founder of the Ashoka network of social entrepreneurs. Jeff Skoll, founder of the Skoll Foundation, and first president of eBay, provides a preface. 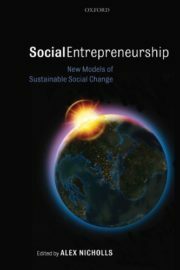 Alex Nicholls provides a substantial new preface to this paperback edition, reflecting on the latest developments in the study and practice of social entrepreneurship.